The addition of the Rare-designed Avatars in the New Xbox Experience hasn't amounted to much beyond an increasingly expanding virtual wardrobe. But Microsoft may have grander plans for the little guys. While there are a handful of games that already support Avatars in-game—Scene It? Box Office Smash, Uno, etc.—as far as games are concerned, they're just scenery. 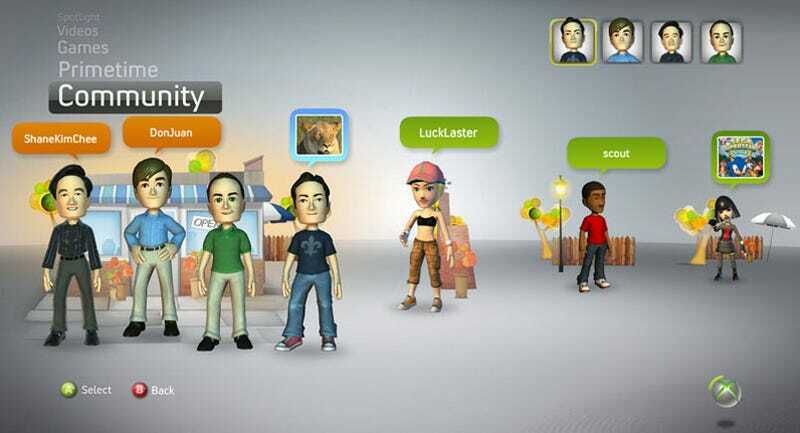 That may change, as Microsoft is surveying gamers on what they'd like to see added to the Xbox 360's Avatars. One of the more interesting possibilities include "special avatar gear" that can be earned in a fashion similar to Achievements. Microsoft has hinted at this possibility before, but it's at the top of the list of changes being surveyed. Also noteworthy are Avatars that are auto generated to look like their owners, presumably via the Xbox Live Vision Camera, and a set of "family" Avatars, including kids or pets. The full list of survey questions regarding Avatar changes looks like this. I might poo-poo or shrug at the majority of those potential changes—no, I don't want to buy Avatar accessories, thank you—but the option of game-specific visual changes certainly sounds neat, as does the "virtual social setting" where Avatars can hang. Clearly someone's a little jealous of the runaway success of PlayStation Home, the ideal platform on which to virtually chill. Now if I can just get my Twitter feed to affect the mood of my Xbox Avatar and then have that show up on my Facebook page, well, I'll be all set.